Polaroid has introduced a new "smart" camera, powered by the Android operating system and in the same shape as a mobile phone. The Polaroid SC1630 features a 16 million pixel camera with a built-in 3x optical zoom, touch screen display and integrated wi-fi, designed for uploading to social networks quickly and easily. By using Android, the camera merges the optics of a digital camera with the opportunity for extension via apps on the Android platform. Polaroid says that this makes the process of clicking, editing, uploading and tagging to be an instant experience on one device. The camera is also lightweight, weighing in at less than 150g. Polaroid is claiming that the camera surpasses the ability of "even the most powerful camera phones". Other features include 18 scene modes and a 3.2 widescreen display. Face and smile detection, along with the ability to automatically organise photos by date, location and people are also included. Geotagging features, such as adding longitude and latitude coordinates to photos are available. On board editing features on the SC1630 include cropping, red-eye removal, resizing and colour correction. The camera uses microSD cards, which are available up to 32GB in size. Connectivity options include Wi-Fi, Bluetooth and optional cellular data, meaning that images can be shared from anywhere in the world. The SC1630 also supports the Google Android market, which has more than 400,000 apps. 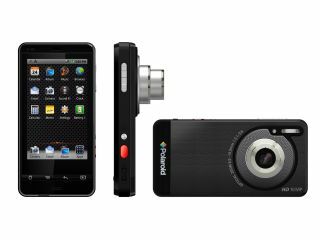 The Polaroid SC1630 Smart Camera price is not yet known, but it will be available from this year onwards.